Vacation rental condominium. Sleeps 6, 2 bedrooms, 1 bathroom. Dogs allowed. Overall experience was wonderful. Exactly what we were looking for to get our kids out on the slopes for the first time. The place was clean, organized, quiet. Fun get away with many places to see in the area. We love to hike, explore, sight see so it was perfect for us. Wonderful family time spent together. I was never able to get somebody to eliminate the odor in the hot water which made it very hard to shave. It was even suggested that I heat the cold water in the microwave for shaving. Really? The cabin was everything that was described. It was a 100' from a chair lift. Everything inside was clean and in good working order. Beds were a little outdated but clean. Only complaint is Big Powderhorn's website. It suggests/implies that lift tickets are included with your stay...they are not. Not a big deal but it should be clearly stated that they are not included. Upon our arrival we were very happy to see that base camp 1 had been recently updated. The kitchen area and bathroom were brand new. We loved the convenience of the ski hill and chair lift right in our backyard. Views were awesome and the fact that we could bring the dogs made it possible for our whole family to vacation together for the first time in a long time. Slopes were well groomed and the chair lift operators friendly and helpful. Unanimous family vote to return next year for more fun!!! Remodeled and in great condition. Could not really ski in - ski out as easily as it would seem. Guests upstairs drunk sounded like they were coming through the ceiling all night. Not much for sound proofing. Would book 1&2 together with another family rather than deal with all night partiers upstairs. Very clean and nice though and staff was great to work with. Great skiing - the ski lift is 50 meters from the door. Only one complaint: The sofa/bed was broken (from a prior guest) and two people slept on the floor for 4 nights. Great ski in / out location. Nothing too fancy, just a great spot. Great location, nice property but could hear everything that upstairs guests did. Also TV reception was funky. Would like the hot tub filled and turned on. 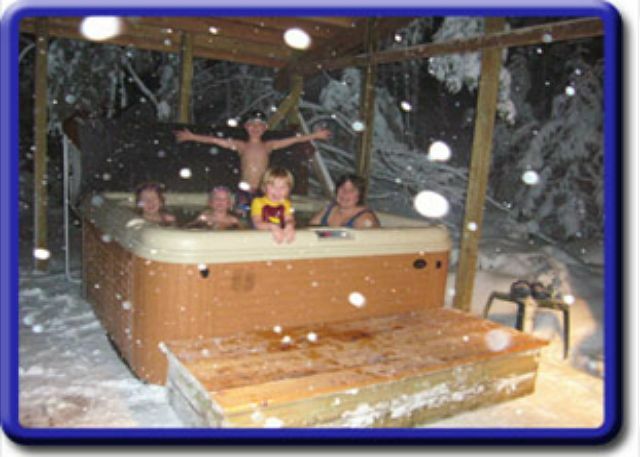 Hot tub was great, easy ski in & out, the lift was 100 feet away from the back door connecting to green, blue & black runs. Rustic but comfortable.